Yay! I finally get to play with some nail art goodies. I'm so backed up on swatching that I don't get to do as much nail art as I'd like. I need to change that. After all, nail art is what brought me here in the first place. I'm excited for the first Lacquer Legion Challenge...REINVENTION! Join Chalkboard Nails, The Nailasaurus, Rebecca Likes Nails and me as we create our version of the theme and post next Monday, 27 January. Everyone is welcome (and encouraged) to participate! Visit this post for more info. Today's Spring-y nail art is an eclectic look created from two new Nail Rock nail art kits from Rock Beauty London. With Zoe Pocock at the design helm, Rock Beauty carries a full line of funky and innovative beauty products for nails, face, lips and body. If you don't know Zoe Pocock...you most definitely know her work! She's the celebrity nail tech who conceived the famed Louboutin-inspired mani. It's no surprise that her nail wraps and kits are so creative and fun (check them out here). For this look, I used two new kits, White Hot RockKit and Pastel Holo Texture Manicure Kit. You can see what came with each kit at the end of the post. On four fingers, I started with three coats of the baby blue creme polish from the Pastel Holo kit. It's pretty sheer. If I was wearing this polish sans decoration, I would have gone for a fourth coat. On the accent finger, I polished two coats of white from the nail polish pen that came in the White Hot kit. The instructions say to place your decorations onto the wet polish. Instead, I used Seche Vite to attach the embellishments...that way I could dab it on as needed. Using tweezers, I placed small round holo sequins onto the accent nail. (I cut a few in half using a nipper for the end of the nail.) On the middle finger, I applied a full nail of tiny clear caviar beads. I gently pushed the beads around and into the polish to get everything covered. On the remaining fingers, I used the pointed pen tip from the nail art pen to create a teeny white dotted design. The white polish flows really easily, so I was able to create reaaaally small dots by touching the polish (not the metal tip) to the nail. It turned out so much more delicate than if I'd used a dotting tool. The White Hot Kit is in the tray in the pic above. One end of the pen has a double cap so you can apply polish with a brush or use the tip. The other end holds small iridescent glequins that you can sprinkle on a wet nail. This kit also includes iridescent flakes, silver foil and clear caviar beads. My only gripe is brushing on polish from the pen is a little tricky. The mouth of the bottle is open (no "neck") and as I said, the polish really flows. So you have to balance the pen on one end and pray it doesn't tip over while you use the brush! But I managed. 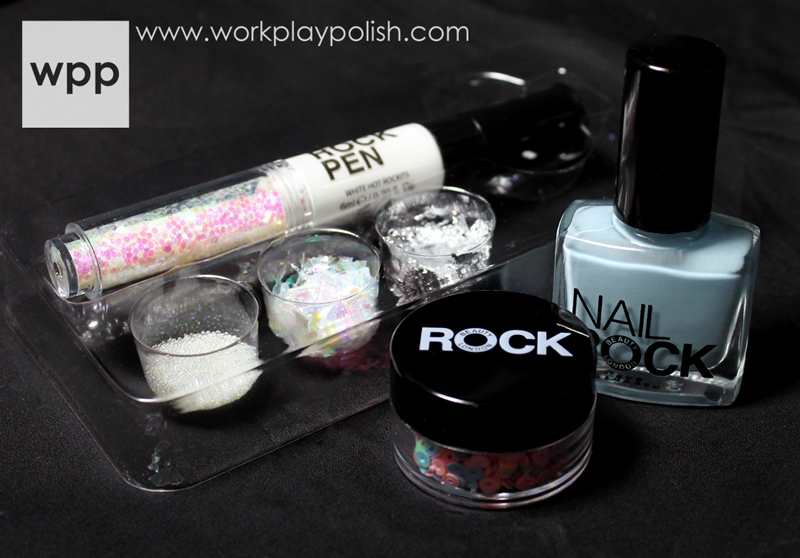 The Pastel Holo kit includes the blue polish and a decent sized container of sequins. I think these kits are fun. I believe Nail Rock has made it's way into a Birchbox before. Have you tried a kit? If so, share it! You can upload your your Rock Beauty looks to their website here. Nail Rock can be purchased in the Rock Beauty Store online and in select stores and e-tailers such as Urban Outfitters, Claire’s, Rue21, Ulta and beauty.com. Be sure to follow Nail Rock on facebook and instagram for new product info and promotions.